Did you know that Ivanka Trump is an expert on education policy? Well, the president’s daughter wants you to know that she is, especially when it comes to “tech.” The 35-year-old former fashion designer outlined her grand plan for the future of technology education in a New York Post column on Thursday. In brief, the plan involves the Trump administration throwing a lot of money at various public and private organizations, Ivanka making appearances with tech executives at charter schools, and, somehow, Betsy DeVos doing her job. Ivanka’s column comes almost two weeks after President Trump directed the Education Department to spend $200 million annually on science, technology, engineering, and math (STEM). This was a surprising move, since Hillary Clinton made a similar promise during her 2016 presidential campaign, and Trump has historically ignored the issue. But now, Ivanka is here to help. On Wednesday, Microsoft President Brad Smith and I joined Code.org founder Hadi Partovi in Virginia for an “Hour of Code” with the students of Middleburg Community Charter School. We participated in Minecraft coding with fourth- and fifth-graders. Seeing the enthusiasm and drive of these young people drove home how essential early exposure to computer science is. In other words, Ivanka says watching kids use computers “drove home” how important it is that we teach kids about computers. This is like going to a library to see kids read books and then stagger into a revelation that it’s “essential” that kids learn to read. There’s also no evidence in this column, at least, that Ivanka has any idea how education works or what exactly the federal government needs to do improve technology education. Ivanka’s on-the-ground report actually highlights the extent to which the Trump administration is out of touch with the majority of Americans on education. Middleburg Community Charter School, the school Ivanka visited with her wealthy supporters, is a small, mostly white charter school just outside of Washington DC. The president of the school’s board of directors is a former appointee of President George W. Bush who worked as an assistant secretary at the Department of Homeland Security. This doesn’t really sound like a model school, one that could exist in every small town in America. Then, on Tuesday, I traveled to Detroit to join the Internet Association, Dan Gilbert of Quicken Loans, Marilyn Hew­son of Lockheed Martin and leading members of the technology sector as they announced their own $300 million private-sector pledge to advancing computer-science education. I’ll go ahead and make the jump: Ivanka has no idea what she’s talking about. Expressing the idea that better technology education, especially for girls and minorities, is a very popular one. Even Hillary Clinton likes it! But writing checks for the private sector to figure out how to do this hardly ensures success. Some might say that shoveling money at charter schools actually disenfranchises the students who need help the most. This has long been the stringent criticism of Eduction Secretary Betsy DeVos, who will be in charge of carrying out Ivanka’s unoriginal mission. DeVos is a devout believer in “school choice,” which means poor students should be able to go to the same schools as rich students. She’s been a stringent advocate for the voucher system, which teachers hate because it diverts money from the public school system to the private sector. In other words, the poor public schools get poorer as their best students get shuttled off to private, for-profit, or charter schools. It’s not unlikely that a DeVos-led push for better STEM education might amount to sending more kids to schools like Middleberg Community Charter School, where strong technology programs are already in place, rather than building out programs at regular old public schools. But we don’t yet know what Betsy and Ivanka want to do. Ivanka doesn’t say much more than “I want to do this popular thing” in her Post column. DeVos is busy beefing up on security, since her ideas are so unpopular that she fears for her own safety. (That security detail will cost taxpayers over $6.5 million over the next year by the way.) 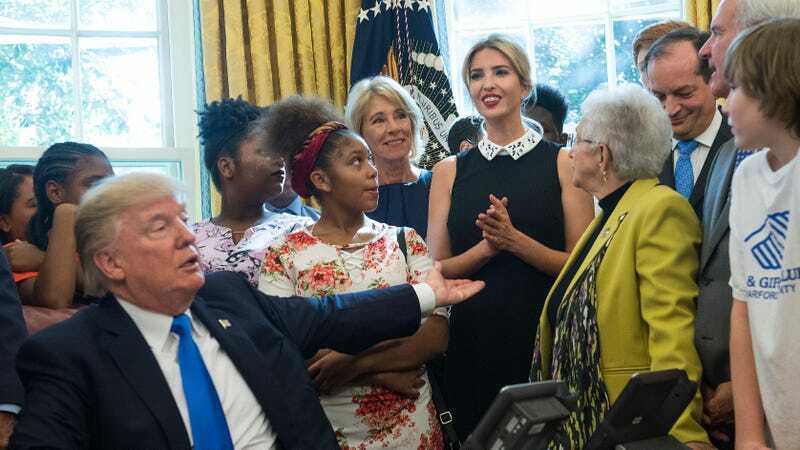 Neither of these women have any concrete classroom experience, although we do know that Ivanka has visited at least one classroom in a norther Virginia charter school. DeVos, meanwhile, did mentor a couple students in Michigan public schools, both of whom she later removed from public schools and sent to private school by paying their full tuition. Does something seem unusual about all of this? Do you get the impression that promises are being made for political gain but setting into motion a series of events that will cost taxpayers hundreds of millions of dollars and potentially do more harm than good? I do get that feeling, and that in mind, I’m inclined to agree with Jennifer Rubin from The Washington Post: Ivanka Trump and her husband have no business being in government, and they need to quit.